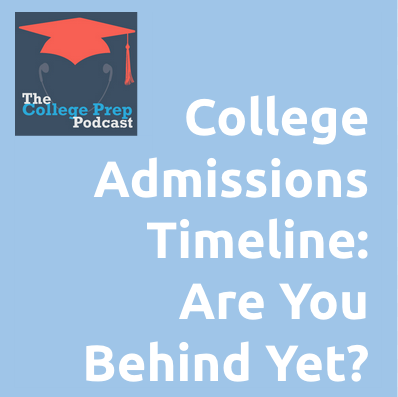 002: College Admissions Timeline: Are You Behind Yet? As a college admissions expert and test prep guru, Megan gets questions all the time from panicked parents worried that they are dangerously behind on the journey to get their teen into the perfect college for their teen. 7th and 8th grade: Megan discusses the importance of learning how to learn (rather than focusing on grades), and helping young teens follow their curiosities and passions. 9th grade: Families can continue to develop interests, but this is the time to begin focusing on a students’ GPA as well. 10th grade: Students can begin taking practice tests like the SAT, ACT, and PLAN. The summer between 10th and 11th grade can be spent beginning to study for these tests, as well as mapping out a schedule for handling the busy-ness of junior year in a stress-free way. 11th grade: This is the busiest time for the college prep process! Students will take the SAT and/or ACT several times, and many may also need to schedule in SAT subject tests and AP tests. Students should also begin visiting colleges at this point. 12th grade: Students are busy applying for colleges in the first half of the year, and then filling out the FAFSA beginning January 1st. 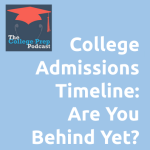 Listen to this episode for more details about each of these steps in the college admissions process. Megan reassures parents to take a deep breath and realize that, unless you’re only starting to think about college in their students’ junior year, you are not behind yet! For more great information, sign-up for Megan’s free 15-day mini course.